Sega-16 – First-Person Shooter Games on Genesis: Ambition or Folly? Simply getting a first-person shooter operational on a stock Genesis is pretty impressive. The Genesis was designed with 2D games in mind, and polygons devour processing power like it’s going out of style. So do the other things that turn a bunch of flat-shaded gray blocks into a real game: sound, textures, weapons, pickups, and enemies. But in the wake of Wolfenstein 3D and Doom, developers were willing to do anything it took to cash in on the fun. The future of the brand-new genre was bright indeed and history was in the making, but would the aging Genesis have a chunk of that history? Limitations would have to be passed and boundaries expanded. “Without direct hardware support, sprite scaling and rotation had to be realized through coded algorithms in the software. Although software effects were faster, since they didn’t have to be loaded off the hardware, they were also choppier. And since 3D views require fluid changes in size and angle in order to be convincing, this was an obvious problem.” For an FPS to be done right, the Genesis would need some help so that more complex software scaling routines could be executed quickly without slowing down the game. Experienced programmers knew all sorts of techniques to get that extra va-vroom, short of using the Sega CD or 32X. Documentation is limited, so it’s hard to say which of these tricks developers put into action, if any. Still, here are just some of the options open to those ambitious (or foolish) enough to bring the FPS phenomenon to Sega’s 16-bit system. One was to eschew the default 7.6 MHz clock speed and switch over to the 13.4 MHz alternative that was built into the cartridge port. This method forced the 68000 processor to perform calculations much more quickly, thereby eliminating the lag caused by other components in the Genesis having to wait up for its results. A second method – one used by Electronic Arts with their line of polygonal flight simulators – was to get the Z80 sound processor and the 68000 main processor working together as a single unit, much like the Saturn’s dual-core architecture. It has been noted, however, that this setup was extremely difficult to program and synchronize, thanks to the radical difference between the two chips. The third option would have been to use Sega’s own Super Virtua Processor (SVP) technology. In the end only four first-person shooters were commercially released: Cyber-Cop, Battle Frenzy, Zero Tolerance, and Duke Nukem 3D. A fifth, Beyond Zero Tolerance, was cancelled in the beta stage. Another, Doom, was ported to the 32X instead. Only these four games made it all the way from the drawing board to reality, from a programmer’s devkit to a consumer’s stock Genesis. For that alone they deserve a degree of commendation. 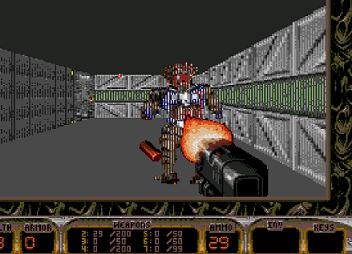 Leading the charge was Core with their 1992 release Cyber-Cop (also known as Corporation). We all know that Core was no slouch when it came to graphics – Skeleton Krew and Wolf Child were both impressive. But those games came out late in the Genesis life span, and one can only assume that they were still learning the hardware in ‘92. For the first of its kind, Cyber-Cop certainly isn’t the sort of model game one would hope for. If anything, it’s a great example of how not to code an FPS. The use of polygonal level geometry instead of raycasting is impressive, but this small feat is outweighed by ugly, untextured surfaces and an unbearably close fog line. And taking away the player’s ability to aim at targets for himself? Bad move. Gamers weren’t so hyped over Wolfenstein 3D that they’d overlook these sorts of problems, and Cyber-Cop quickly found its way into bargain bins and subsequent obscurity. But the world stops for no one, and hot on the heels of Wolfenstein 3D came the PC phenomenon that would redefine video games, for good or ill. That, of course, was Doom, the spiritual successor to Wolfenstein 3D. If it hadn’t been clear enough before, it was clear now: there was major money to be had with FPS titles. Hence the release of Domark’s Battle Frenzy in 1994. The game was as much of an improvement over Cyber-Cop as Doom had been over Wolfenstein 3D, sporting textured walls and more colorful graphics. Better yet, the levels were designed so that clipping boundaries were not visible, and the result was a much less disorienting experience. Gameplay was also smooth and clean, if sluggish, with a nice array of weapons to work with. It was a much better package than Genesis owners had seen yet, but even this was not enough to woo gamers. Battle Frenzy was received with only average interest. Unfortunate, but understandable – with the lauded 32X on the horizon and superior games on personal computers, Domark’s modest accomplishment was stale the moment it hit store shelves. A Sega CD version was also released with predictably limited improvements and predictably mediocre sales. I originally designed Zero Tolerance as a game called MatriX, back when I was in high school, in the early ’80s. In 1994, after having developed a fully functioning prototype of the game with an extremely talented staff, I partnered my independent game development company, Technopop, with publisher Accolade. Accolade marketing felt that the name MatriX was too technical in nature and would cause confusion to the consumer. I renamed the game to Zero Tolerance, and its sequel, Beyond Zero Tolerance. A few of the key staff members are the actual game characters you play in the game. One of our unpublished easter eggs is that you can type the phrase “BOXING” into the password screen and be put into a 3D boxing ring at the top of one of the rendered city skyscrapers with the actual final boss from the game. It’s a pretty tough, no-weapon brawl. It is now 1998, and the Genesis had just been discontinued in all markets, and newer, more advanced consoles are on the market. Doom has been overshadowed by Quake. Wolfenstein 3D seems like a distant memory. Yet Brazilian developer TecToy releases Duke Nukem 3D for the Mega Drive. Contrary to popular belief, Duke Nukem 3D is not a bootleg or pirate cart. It’s an official game from an official Sega licensee…although it’s nothing like its source material. Sure, the title screen and cart label bear Duke‘s name, but that’s where the resemblances end. In the end it’s Zero Tolerance all over again, with a slightly faster frame rate and a larger screen size. The question is, did anyone care? It’s hard to say for sure, but between the game’s limited release and the rigor-mortis status of the Mega Drive, it’s extremely unlikely that TecToy made much money off of it. Worthy of honorable mention is Psygnosis’ 1996 release Toy Story, which features an FPS-style stage in which Woody must gather a bunch of those annoying alien squeaky toys. What’s so ironic is that this is probably the most advanced FPS on the system, and there’s no combat! The famed boys from Scotland really shamed the competition here with almost full-screen (!) graphics and silky smooth motion. It’s too bad they didn’t take a crack at their own Doom clone, because it’s clear that they had the prowess. In the final analysis, was it all just foolish ambition? The answer, as sad as it may be, is yes. The early effort, the one that had a chance of capitalizing on the FPS fever of the early ‘90s and Sega’s soaring popularity, was inexcusably weak. By the time developers got it halfway right, there just wasn’t sufficient interest in the Genesis to make it profitable. It’s unfortunate that these later projects were doomed (no pun intended) from the get go, because they’re remarkable from a technical standpoint. What’s more unfortunate is that we could have seen superb releases on the 32X had developers been given the chance to learn the add-on like they had the Genesis. Can you imagine what companies like Core, Zyrinx, Domark, Psygnosis, Nextech, Treasure, and Clockwork Tortoise could have done with that little black mushroom, given a little time? But it’s all just dreaming and speculation. The hard reality is that the FPS attempts on the Genesis tanked, becoming nothing more than intriguing showcases for tech-minded retro gamers. The ambition was indeed folly. Toy Story was developed by Traveller’s Tales, not Psygnosis.